Drug Discovery from A to Z … Arrhythmias to Zebrafish! Caption: Healthy zebrafish (top) compared to zebrafish with arrhythmia-causing mutation (bottom). Their hearts are shown to the right, with enlargement indicating a weaker heart. The heart’s outflow tract is marked OFT; atrium, a; and ventricle, v.
Arrhythmia is a condition in which the heart loses its regular rhythm, beating either too rapidly or too slowly. Occasional irregular heartbeats are harmless, but if sustained they can cause dizziness, fainting, and even sudden death. There are a number of drugs available that can prevent arrhythmias, but none are perfect. Implanted devices can help—pacemakers can keep the heart from beating too slowly, and defibrillators can reset the heart’s rhythm with an electrical shock if a dangerously rapid rhythm develops. But new treatments are needed. Now, an NIH-funded research team has created an animal model that is advancing efforts to find new drugs to prevent arrhythmia. Led by Jeffrey Saffitz at Beth Israel Deaconess Medical Center, Boston, researchers used genetic engineering techniques to produce zebrafish with genetic mutations identical to those in some people who suffer from a rare inherited disease called arrhythmogenic cardiomyopathy (ACM). In humans, ACM leads to dangerous arrhythmias that can cause sudden cardiac death, usually in people under the age of 35. The genetic mutations responsible for ACM disrupt proteins that make up the desmosome, which is a cellular junction structure that glues heart cells together and is vital for proper electrical signaling and regular heartbeats. Microscopic exams of ACM patients’ hearts show that many muscle cells have been replaced with fat and scar tissue. An even closer look reveals that while some of the proteins that make up the desmosomes are still present in the heart cells, they are present in the wrong location—floating in the interior, rather than on the surface where they can seal the cells to their neighbors and electrically activate the heart. As part of their effort to find drugs that can head off arrhythmias in ACM patients, Saffitz, Calum MacRae of Brigham and Women’s Hospital, Boston, and their colleagues engineered zebrafish to contain a specific mutation in the plakoglobin gene—the same mutation that causes a severe form of ACM in humans. These “ACM” fish had enlarged, weak hearts with thin muscle walls that couldn’t pump blood properly. A peek inside their cells also confirmed that the proteins required to form the desmosome were in the wrong location. In addition, the researchers observed that the ACM fish’s heart muscle cells contained fewer protein channels that help to regulate electrical activity than those of normal fish. In the next phase of their drug search, the researchers took two-day-old ACM zebrafish embryos, which already displayed abnormal heart activity, and placed them in a high-throughput system to screen for drug-like compounds, called “small molecules” to distinguish them from antibodies or other proteins, that could halt and/or reverse their cardiac problems. These ACM fish carried a reporter gene that produced light when their hearts began to fail. Any molecule that reversed or blocked that heart failure—and dimmed or switched off the accompanying light signal—was a possible drug candidate. Of 4,800 small molecules screened, three showed some therapeutic activity, and one of these, called SB216763, appeared to erase the disease completely. 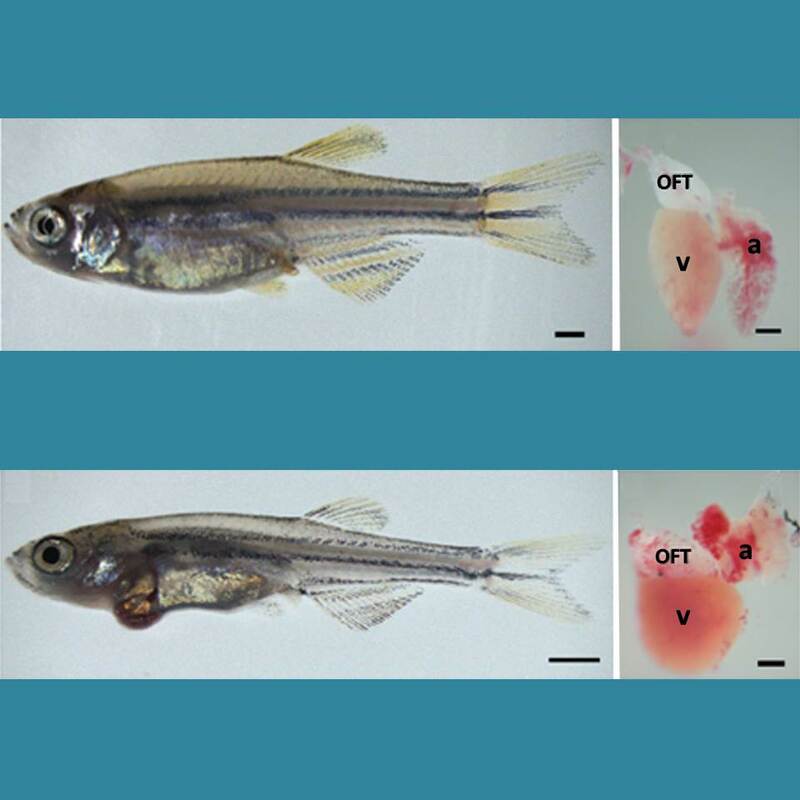 Not only did SB216763 normalize heart development and prevent heart failure in the embryonic fish, it corrected the location of the desmosome proteins and restored proper electrical activity. To test whether SB216763 also works in mammals, Saffitz’s team engineered rat heart cells to contain the same ACM mutation as that in the zebrafish. As was seen in the fish, the mutant cells were more prone to die than normal rat heart cells, and desmosome proteins were in the wrong location. Treatment with SB216763 also reversed the protein abnormalities in these cells within 24 hours and prevented cell death. Similar observations were made when SB216763 was used on human heart cells derived from induced pluripotent stem (iPS) cells made from the blood cells of two adult patients with ACM. While these early results are encouraging, this candidate drug will need to undergo further testing for safety and efficacy before moving on to possible human clinical trials. In addition to the hope it raises for drug-based approaches to arrhythmia prevention, this new work provides yet another powerful example of the value of zebrafish and other animal models for biomedical research. Not only can such models be used to help us better understand the molecular mechanisms underlying human diseases, they may enable us to screen more rapidly and cost effectively for new therapeutics to treat those disorders. Identification of a new modulator of the intercalated disc in a zebrafish model of arrhythmogenic cardiomyopathy. Asimaki A, Kapoor S, Plovie E, Karin Arndt A, Adams E, Liu Z, James CA, Judge DP, Calkins H, Churko J, Wu JC, MacRae CA, Kléber AG, Saffitz JE. Sci Transl Med. 2014 Jun 11;6(240):240ra74. To find cures without animal testing and manipulation would be ideal. Great article! Must read for all bloggers. Dr. Francis Collins, thank you for the article!